In this integration guide we will take you through the most important steps of instrumenting your game with the GameAnalytics Unreal SDK. Make sure the Plugin is enabled by clicking Settings → Plugins. Check Installed → Analytics for GameAnalytics plugin. Check Built-In → Analytics for enabling the Analytics Blueprint Library. Finally, add the following to your project’s DefaultEngine.ini file located in the Config folder. There are 2 ways of installing the plugin manually. When using the full source version you compile the Unreal Editor yourself. It is possible to add the plugin at this stage to be part of the engine and available for all projects created using that compiled version. A pre-compiled editor can be downloaded through the Epic Games Launcher or built from source. When GameAnalytics is not part of the editor it needs to be added to the specific project. Add the GameAnalytics folder to a \Plugins subfolder in your specific project folder. If this Plugins subfolder doesn’t exist then create one. The project has to be a C++ project for the plugin to work. If you have not already, you can register for a GameAnalytics accounts via our online form here. After you have signed up you will be asked to create a studio and a game. If your game is already published and on an app store you can search for it using the provided search field or else you can create it manually. On the Account tab you can Login to a GameAnalytics account directly in the editor. Login through Project Settings allows you to select your studio and game for each platform. When selected the game key and the secret key will be automatically fetched and configured. You can always locate the keys in our tool via game settings. To use GameAnalytics you need a game key and a secret key for each platform you are using (iOS / Android). The game key is a unique identifier for your game while the secret key is used to protect event data from being tampered with as it travels to the GameAnalytics servers. You can access your game settings via Project Settings, then selecting GameAnalytics within the Plugins section. During gameplay it is possible to set values for 3 different custom dimensions. For each custom dimension it is needed specify a whitelist. You cannot set a custom dimension value unless it is specified here first. The build version should be used for changing production builds of the game. If you are knew to GameAnalytics and our Events, please read our event guide here. You will get the most benefit of GameAnalytics when understanding what and how to track. To initialize the GameAnalytics SDK in Blueprint you must first call The Analytics Blueprint Library action called “Start Session”. Note that you should call this action before sending any events. The Start Session action alone is enough to track general user metrics such as DAU (Daily Active Users), MAU (Monthly Active Users), Retention, etc. The SDK should only be initialised via blueprint. Initialisation via code is not available. Business events are used to track IAP transactions with real money. A Business event can be set up in Blueprint as shown below. The GameAnalytics action used is “Add Business Event”. Game Currency Type should be set to the currency code in ISO 4217 format. Game Currency Amount should be set to the amount in cents (or the lowest currency denominator). Receipt validation is supported for the following stores. So on Android receiptCipheredPayload contains the signature needed for the business events and iOS receiptCipheredPayload is the receipt. signature base64 string INAPP_DATA_SIGNATURE.null allowed.Read about Android signature here. receipt base64 string INAPP_PURCHASE_DATA.Nil allowed.Read about Android receipt here. Resources events are used to track your in-game economy. From setting up the event you will be able to see three types of events in the tool. Flow, the total balance from currency spent and rewarded. Sink is all currency spent on items, and lastly source, being all currency rewarded in game. A Resource event should be set up in Blueprint as shown below. The GameAnalytics action used is “Add Recource Event”. ItemId should be set to the specific item bought. flowType enum yes Add (source) or substract (sink) resource. currency string yes One of the available currencies set in Project Settings for the GameAnalytics plugin. This string can only contain [A-Za-z] characters. itemType string yes One of the available item types set in Project Settings for the GameAnalytics plugin. In a game where the user collect coins fairly fast you should not call a Source event on each pickup. Instead you should count the coins and send a single Source event when the user either completes or fails the level. Progression events are used to measure player progression in the game. They follow a 3 tier hierarchy structure (world, level and phase) to indicate a player’s path or place. A Business event should be set up in Blueprint as shown below. The GameAnalytics action starting with “Add Progression Event with…”. progression01 string yes 1st progression (e.g. world01). progression02 string no 2nd progression (e.g. level01). progression03 string no 3rd progression (e.g. phase01). An Error event should be set up in Blueprint as shown below. The GameAnalytics action used is “Add Error Event”. Error should be set to the severity of the error recorded (must be “debug”, “info”, “warning”, “error” or “critical”). Used to track any type of design event that you want to measure, f.x. GUI elements or tutorial steps. Custom dimensions are not supported for design events. Here are three examples of how to set up Design events in Blueprint. The GameAnalytics actions that can be used to send Design events are: “Add Design Event” and “Add Design Event with Value”. The event name is a String which can consist of 1 to 5 segments. Segments are seperated by ‘:’ and segments can have a max length of 32. (e.g. segment1:anotherSegment:gold). During gameplay it is possible to set values for 3 different custom dimensions. For each custom dimension it is needed specify a whitelist in the GameAnalytics tab under Project Settings. You cannot set a custom dimension value unless it is specified here first. Here is an example of how to set a custom dimension in Blueprint. The GameAnalytics action used to set a custom dimension is “Set Custom Dimension 01”, “Set Custom Dimension 02” and “Set Custom Dimension 03”. Dimension must be set to one of the available values for that custom dimension, defined in the GameAnalytics tab under Project Settings. To reset any of the current custom dimensions just set it to empty string. When using custom id you need to remember GameAnalytics will first be fully initialized when you have set the custom id. No events can be sent before GameAnalytics is fully initialized. If your game has Facebook integration you can submit the Facebook Id to GameAnalytics. You will then be able to get additional information about the types of players which play your game. Here is an example of how to set the Facebook Id in Blueprint. The Analytics Blueprint Library action used to set a custom dimension is “Record Event with Attribute”. Attribute Name must be set to “facebook”. 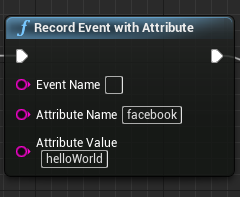 Attribute Value is used for the actual Facebook id. If your game has information about the player’s gender you can submit this to GameAnalytics. You will then be able to get additional information about the types of players which play your game. Here is an example of how to set the player’s gender in Blueprint. The GameAnalytics action used to set gender is “Set Gender”. If your game has information about the player’s birth year you can submit this to GameAnalytics. You will then be able to get additional information about the types of players which play your game. Here is an example of how to set the player’s birth year in Blueprint. The GameAnalytics action used to set a custom dimension is “Set Birth Year”.